to install, just unpack BRKart_Tracks folder into your rfactor/gamedata/locations folder. if you already have one BRKart_Tracks folder into your rfactor, just overwrite it. This track was made to BRKart mod. It don't was tested with other mods. There are currently no setups for Kartodrommo Internacional de Braga. Add a Setup. 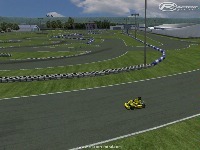 GrandPrixName = Braga Kart //this must be the same as event name in order to sort circuit info correctly. GrandPrixName = Braga_Kart_1	//this must be the same as event name in order to sort circuit info correctly. hello gulfitoso. please, tell me if you have a folder named "BRKart_Tracks" into your "Gamedata\Locations" folder. If i dont be wrong, wen you unzip braga.rar file, you found one folder named BRKart_Tracks. if its correct, just unzip this folder into your locations folder. if folder into zip have other name, like Braga_Kart_1 (i sincerelly dont remember now), just create a "BRKart_Tracks" folder into "locations folder, ok? Adriano mate, it's good to see you back! How are you? This addition of track is amazing. Can't wait for BRKart v2.0! Take care. how, thats a incredible coincidence! i see now that vasco sameiro track was release today. in the same day that vasco sameiro kart track! amazing! please, if yo have problems with frame rate, put your shadows in medium. it will solve your low frame rate. best regards. Any news on this track?